View from the Kluszkowce ski lift. In November 2009 Poland celebrated twenty years since the fall of Communism. The new EU country has developed quickly, with modern roads and hotels as comfortable as in any other Western European nation. Despite so many changes, some Polish traditions have continued for generations. In particular, Poles have a penchant for fleeing the cities during most holidays to go and enjoy the fresh outdoors. Any expat or traveler would be amiss not to do the same. By far the finest choice is the Tatra Mountains. Known as Poland’s “Winter Capital” thanks to the abundant ski resorts, during the summertime a temperate climate brings visitors to the Tatra mountains who are curious to experience Polish highlander culture. A drive through the 2-lane roads means passing hamlet after hamlet dotted with haystacks, timber cabins, and breathtaking mountain views. The Tatras boast the highest mountain ranges within the Carpathians—a 1,500-kilometer range that forms an arch east and south through Slovakia, Hungary, Ukraine as well as Romania. Highlanders of the Tatras are better known as “Gorale,” and live in what today spans southern Poland and northern Slovakia. 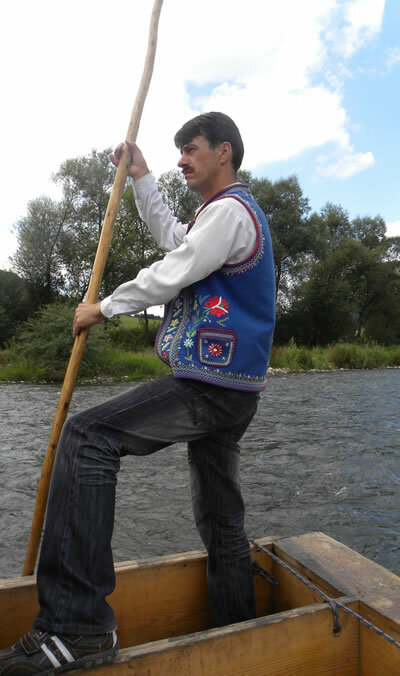 A slice of their culture can be grasped in the Pieniny National Park where the Polish Association of Pieniny Rafters offers raft rides on the Dunajec River. The ride starts in the small town of Katy and wades for eighteen kilometers along the Polish-Slovak border. The river gorge often narrows, sheer limestone rock on either side scaling up to two hundred meters high. The raftsman, wearing the traditional blue highlander vest, asks visitors if the river will now turn left or right. The joke is always on those on the rafting adventure, as the twists of the river give an illusion of turning in one direction, but then go in the other instead. The raftsman leaves visitors off at the town of Szczawnica where restaurants sit along the harbor. Buses then run regularly back to the starting point. Denied their past for many years under Communism, there is pervasive consciousness of history in Poland, and a visit to the Tatras offers a trek back in time. Only a few kilometers north of the raft ride, the Dunajec Castle in the village of Niedzica hangs off a cliff. Originally built in the early 1300’s when this region was part of the Hungarian Kingdom, the castle had many owners throughout the centuries, even being captured by knight-robbers. The last owner, a Polish countess, abandoned the castle during World War II. In 1963, the Polish government turned it into a museum. Today, a cobblestone entryway leads to a jail where castle owners once incarcerated prisoners who tried to rob them. Deeper inside, a staircase spirals up to a guard’s sleeping quarters where skinned animals on the floor and walls take visitors back to the days when hunting was an essential part of daily life. A courtyard at the castle top overlooks a modern dam built in 1997. On the other side of the reservoir, the ruins of the old Czorzstyn Castle tell a sad story. In 1651, peasant leader Aleksander Kostka Napierski called highlanders to revolt against their nobles. But he and his rebel troops failed perilously, remaining isolated in the Czorzstyn Castle until they were captured and later impaled. The Poles in the Tatra region have a strong tradition of preserving this natural environment, so hiking trails abound. If you stay at one of the multitude of Bed & Breakfasts, the owners often will provide you with their insider recommendations. Our B&B owners not only welcomed us to sit at their backyard bonfire in the evenings for wine and conversation, but also drew us a map and suggested we visit the mountain beyond the small village of Kluszkowce. The town, built by a nobleman in the fourteenth century, has a parish that struts out from the cluster of timber homes. Signs in Kluszkowce’s center point towards a ski lift one kilometer away. Kept open during the summer months, visitors go up the lift to the mountain’s peak where a view stretches out past the Dunajec Castle. Although the ski lift can also take visitors back to the mountain’s base, the pleasure lies in wandering through the forests all around. At the end of the day, timer cabin restaurants serve tasty cuisine in the center of Zakopane, a town that was well known during the 18th and 19th centuries as a haven for Polish artists. Today, restaurants serve an array of hot and cold soups, including barszcz (beet broth), zurek (sour soup) or chlodnik (cold cucumber-beet soup). Pierogi (filled dumplings) are on every restaurant menu, with a large variety to choose from, including stuffed with shredded beef, mushrooms and cabbage, or blueberries with cream on top. But in the Tatras, the regional Placek po Zbojnicku (potato cakes highlander style) provide a hearty meal consisting of two fried potatoes pancakes with meat goulash in the middle. Poland also brews its own beers, including Zywiec and Tatra. But here in Zakopane, it is a particular pleasure to try the hot beer with spices or the hot red wine spiked with cinnamon and rum. Today, Polish highlander culture blends together the beauty of nature, a respect for history, traditional food, and modern conveniences, all of which translates into a breathtaking experience. Trains run from every major city to Zakopane. From Cracow the train ride takes about five hours. Buses are recommended as the trip takes only about two hours starting from the Cracow bus station. A little outside Zakopane in the mountains, this homey B&B was only 70 Euro for the five of us, including a buffet breakfast. Barbara Zaragoza is a Polish-America who lived in Poland during the days right before and after the fall of the Berlin Wall. She currently lives in Naples, Italy where she is a freelance writer.